How do you cut your fret slots? And do you cut them before gluing the fretboard or after? Tablesaw with an inventive jig? Even the results have been good I find it a bit too tedious. Thinking about StewMac jig but it is a bit pricy. 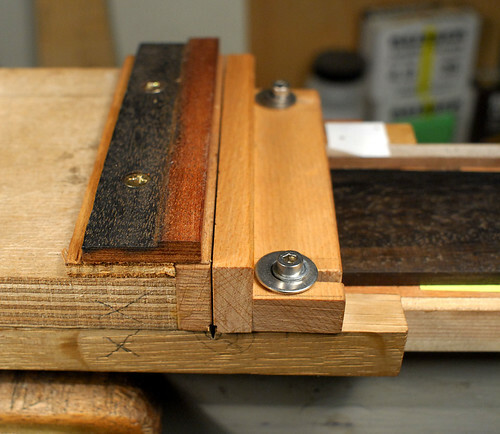 I use a mitre box with slots at each and every fret position. If you buy an accurate commercially available fretboard you can cut down the middle of it to give you the two guide rails. I do a number of scale lengths so I made my own. All cut before gluing the fretboard although once the fretboard is glued on a slot is easy enough to make it deeper should the need arise. Those commercial jigs looked a bit slow and cumbersome to me. I use a GMC fretboard slotting jig, made in Wales, about £75, you can do an internet search for them. They will custom make you any scale length for not much more. Proxxon saw, template and a wood slide. I use the band saw. I lay out lines on the side of the neck. My 1/4" blade makes a .023 kerf if I let the blade linger for about three seconds. I slot after the fretboard is glued to the neck but before glueing the heal blocks. Not sure why I've not seen anyone use a bandsaw for cutting fret slots. Is there a reason not to I don't know about? I cut a slot in a block, flip it around to the backside of the blade and let the back edge of the blade into the groove and use this as the depth limiter. It's important the blade is loaded against both the top and bottom roller bearing. If it is floating forward at all it could cut deeper then the back stop should allow. My bandsaw only has a 14" throat so I cut all the frets except the first three and then flip it over to get them. I use a wedge I tape in place to keep the fretboard 90 degrees to the saw blade. Of course I cut a number of scrap pieces to make sure I'm set up correctly. Of course I screwed up my first one... I was standing there admiring my handy work when my mind asked me, say HR how did you cut the those last three without reshiming for the angle. I recall the deep frown forming on my face as I lifted up the fretboard to eyeball those frets... I filled the slots with epoxy and then recut them. I would worry that a) the backstop depth will gradually increase due to heat and friction, and b) that you are simply eyeballing the pencil line and hoping you get it dead on every time. But hey, if it works for you. Not sure how the backstop depth would increase? It's a fairly low stress operation. I do keep my band saw at the slowest RPM. Thermal expansion of the blade across its width is negladgable. Am I missing somthing. As far as cutting on the line, it's no different then using a hand saw and cutting on the line? I guess if one had never cut anything but a tomato and and a thick juicy steak... It's just a matter of skill, certainly no different then using a table saw to cut fret slots? Except for operator error it works well and only takes a few minutes to set up and less to cut the slots. I've been using wood tools my whole life and still have all my fingers. One does need to know when to cut on the middle,of,the line or which,side. I make a mark accordingly. I would tell my shop minions that the procesion is often limited by the thickness of your measur marking,device when I see them doing some kind of layout with a fat sharpy marker. The last batch I did three at once. I laid out all three necks stacked together and then I didn't have to set up the saw three times. I did look into all the tools used for fret sawing and then I looked at my bandsaw and got the job done. You can make a very accurate cutting 90 deg saw guide - if you make the cheeks a tight fit above the saw kerf. One side is adjustable - so san fit tight to any saw - or be adjusted for tight fit before use. The saw has to enter the guide with the kerf resting on the wood - and removed that way as well. Its very accurate. I position the guide with a guide rod I cut. Or you can buy laser cut notched rules at varying scales. The board is spot glued with paper to the bed - centred exactly to the guide edge - so I am always 90 deg to centre line. its slides along - and is pinned exactly to the index notch at the back - and every cut its clamped in position. Works well - cost nothing ! Its all screwed up so the beech cheeks a can be fettled and waxed for dead flat. The packer on top adjusts the depth on the the saw. I use at the moment a Pax Guitar saw - which work ok if kept sharp ( which is difficult ) At least this guide will fit any saw. I would prefer a Japanese style saw for ebony - but hard to find one at 0.6mm. More of a problem is the saw - as matching slot to wood hardness and to frets is a black art ! Just at the moment - my slots fit my frets - but I have to ease then slightly if the board is very hard stack. Rosewood is just right. Have you found you need to reconsider the width if the slot depending on the wood? I tried the bandsaw method although I rigged up a jig and indexing pin. The slots themselves were perfectly good but my accuracy went out because I had to flip the board due to the bandsaws column. Not sure I could trust myself with free-handing it. If you can do so and obtain 0.3 mm accuracy and better then I guess you are good to go. Woods like rosewood and oak normally require a slightly smaller slot compared to something like ebony which has very little 'give'. Using a glue can help on the softer woods though. I start with the fretboard blank untapered so I can use a square . Mark the fret positions with a sharp marking knife using an accurate ruler and magnifier. Score the positions across with that same marking knife which has one flat side so noting the correct positioning re the marks. I make a fairly deep score with three or four goes. Then I have made a mitre box that hugs my fret saw closely. I get the right depth by riding the back of the saw on the top of the mitre box and packing under the blank. It sounds a lot of work but really doesn't take too long. A note on scale rulers. I have the Ibex one and checked against a known good fretboard it seemed to be seriously inaccurate. Having checked it again recently I see it is some odd imperial scale length rather than 650 mm. Hernadez.... Its a matter of different saws - really - Its all I can do to touch up the sharpness of a 16 tpi saw - adjusting the kerf is really hard. Thats why I would prefer a Japanese style saw - way harder teeth - keep their set better. The problem is you just do not know what the saw is going to cut. I don't believe tool supplier figures when given. So I stick for now with what I have - its cutting well and accurate. I use coiled wire - don't try to straighten it. Nip it off as it is bent - and tap in from either end. You can buy flat wire if you want. For hard ebony I widen the slots. Two ways really - firstly, they tend to widen if carefully re-cut. I often have to deepen as I radius my boards ( 48" ) only slight. Also - the board after mounting often needs scraping down a bit. When generally sawing the first cut one tends to use the middle of the saw - so deepening the cuts with either bitter end - the kerf tends to be fresher ? Slight - but something - you can tell if its tight in the cut slot ? Then my normal fret stock will go in ok on very hard ebony - but I also at times will file the tangs slightly both sides. I do that if the first seem too tight - and moreso on the frets past 14. Its also helps to file the fret slot edges with either a fine triangular file - or better - a fine square file ( more obtuse corners) Helps the fret head to bed properly. Again - more important on ebony than rosewood. I cut my slots the traditional Spanish way - CNC. I’ve done 3 fretboards thus far. I will say, yes it is accurate and the machine does the work but downsides are positioning the fretboard, leveling, modifying CAM files, and breaking bits. Registering perpenducular lines with marking knife on the fretboard a few times in order to make the lines deep enough to afford an initial sawcut, leaning against a steel ruler. Take a shallow cautious initial saw cut with my hand saw which has a previously adjusted depth stop, still leaning against the steel ruler. If the initial saw cut had been made satisfactorily in the registered lines, do further sawing till the lower border of the depth stop touches the fretboard surface. Somewhat tedious but it works for me.